QuickBooks or QB is a program of computer design to manage payroll, sales, inventory, invoicing and other solutions to maintain the company income or other needs of a certain company. This software is a user friendly that a company clerk or accountant can easily manipulate its data and files logically. But this is only a software installed in our computer hard disk which is maintain by operating system, commonly the Microsoft Windows. I personally encountered the error called: “Program:\c:Program Files\Intuit\QuickBooks Pro\qbw32.exe” in different versions of QuickBooks, example the QuickBooks 2010. This error primarily cause in the execution files of QuickBooks, the qbw32.exe. Once this files is corruptible, you can open the QuickBooks normally and you can login through your user name and password. But once your inside the application this error will pop-up and you have no other choice to click ok. But it will determinate your QuickBooks automatically. I did a research through the internet using Google Search Engine. And I found different instruction to fix the runtime problem. But all of those I found then I apply by following it, I was failed. So I use another idea through my self, then this was successful to solve the problem of the QuickBooks using the Windows 7 operating system. Use the system restore of your operating system. But remember, using the system restore all of your current settings and files of your operating system will reset to the default date or old date according to your restore point you selected. But if I where you, select the nearest old date from your current date to avoid loosing much files in your operating system. This is important to use restore your system in normal mode. Because if you remove the QuickBooks and reinstall it again without system restore, you will encounter again and again the error. Then another before to remove your QuickBooks be sure to backup your QuickBooks portable files. How to open system restore? Click start button of your windows, then click all programs. Then follow the screen instruction displayed in your screen. If you’re prompted to select a restore point according to a date, remember what I said above. Then if you’re instructed to restart the computer, do it to take effect the system restore. After a few minutes it will finish, then the computer will restart and back to the windows desktop. 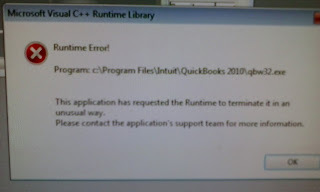 Now its time to uninstall the QUICKBOOKS that cause error and reinstall it again. Once it finish, open your new installed QuickBooks and login using your username and password. And you will be directed to open your backup files you backup before and select the portable files. Follow the instructions of the screen after, then customized again your printer setup for receipt and invoicing. One of the primary cause of the error of the QuickBooks is the update of it. It will happen if your QuickBooks is pirated or not original. So it is recommended to buy and use license QuickBooks in order to avoid errors in the future.